Canvas_Bandit has you creating pixel art on a blank canvas by shooting it with paintballs of different colors. This game is still in development, and will eventually have a narrative and expanded mechanics. 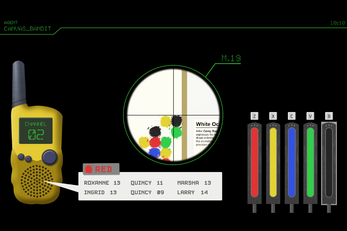 For now, The walkie talkie tells you which spaces to shoot and what color to shoot at them. Made in One Week for Optical Jam 5. Great! Somehow it is very satisfying to shoot a canvas with some kind of paint sniper. Bit annoying to fight the sway though, seems to make me miss my spot a little more then i'd like. Perhaps nerf the sway just a bit? In the demo, it will look like something, eventually, if you follow all the commands. Please be on the lookout for the full version of the game, which will be much more streamlined, and will have multiple levels, and a narrative to go along with it. Thanks for the note about the sway. I'll nerf it.